This Legally Blonde Brunch was for the ultimate Legally Blonde fan. The hosting location was the restaurant/bar 5th and Mad in Midtown. Between the dancing, Q&A contest, and food hitting the table, there was one moment when all heads turned. A little electronic car came in with four adorable puppies. To top it off, all if the puppies had little “Harvard” bedazzled outfits on with bright pink leashes. An older couple were the owners of the dogs. I was happy to just hold two of the squirming dogs, I could not imagine having all of them running around an NYC apartment. The dogs topped off the morning as a perfect addition. Their names were Gia, Pia, Mia, and Tia (Personalized on the back of their pink Mercedes Benz). 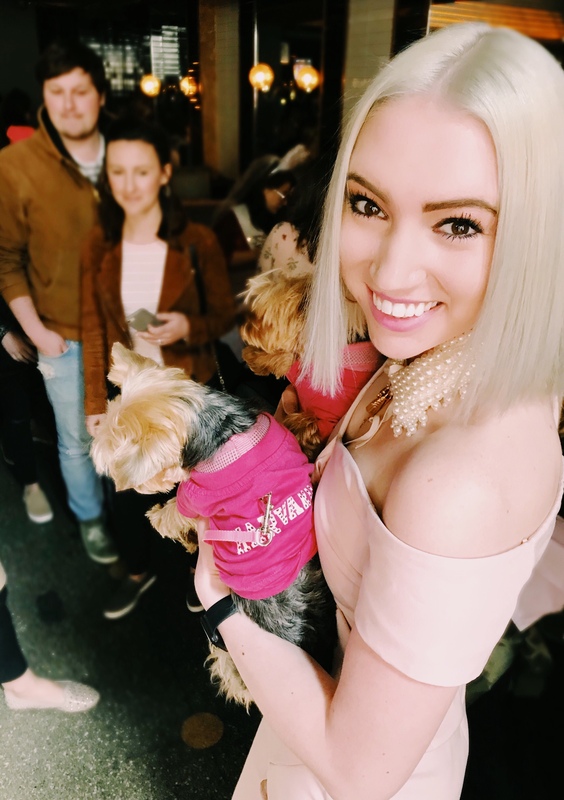 I am not a die-hard Legally Blonde fan, and I did not plan an outfit that was an exact replica of Elle Woods in one of the movie scenes as you can see. Almost all of the girls at the brunch were the spitting image of one of the movie scenes, so I felt a little out of place for coming to experience a completely pink brunch. There was a drag queen dressed in a fabulous pink plasticesque dress as our MC and host for the morning -or should I say afternoon? She had amazing pink eye shadow with jewels, and a large blonde up-do to match her personality. Overall I would give the brunch five stars. With a great MC, a strong dirty martini, and even a Whole 30 approved salad, we left feeling as if we had started our day off on a fabulous note. Hair: I used Luxury Color shampoo to achieve a grey tone. Outfit: My off the shoulder dress and pearl necklace were from Topshop- an Elle Woods inspired look, I mean pearls are a must!